Nepal has secured the top spot in job creation in South Asia, with employment rate hovering around 68 percent, says the latest World Bank report.This means 32 percent of the country’s working-age population —people aged 15 to 64—is either unemployed or voluntarily inactive—the lowest in South Asia. 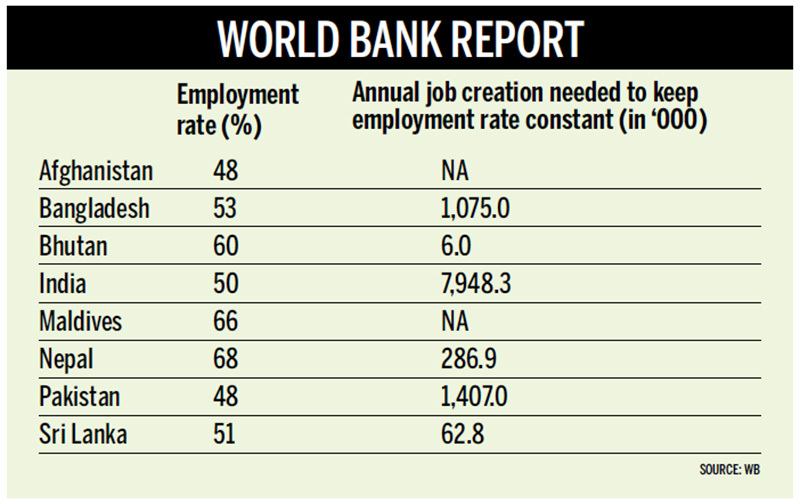 This has made Nepal an exception, as its employment rate is higher than that of many other countries with a similar income level, says the latest World Bank report, ‘Jobless Growth?’, released on Monday. Nepal needs to create at least 286,900 jobs per year to keep this employment rate intact, adds the report. Nepali labour market sees entry of at least 512,000 youths per year, according to the Economic Survey of the Ministry of Finance. Since employment opportunities are scarce in the country, most of the youths who join the labour market find jobs in overseas labour destinations such as Malaysia and countries in the Gulf. Nepal saw departure of at least 1,026 people per day to various overseas labour destinations in the first eight months of the current fiscal year. However, overseas labour migration has been falling for the last two fiscal years, raising the need to create more jobs in the country. It is essential to focus on domestic job creation because the demographic transition is swelling the ranks of the working-age population. More than 42,000 people of working age had joined the labour market per month in the last fiscal year and this number will continue to rise in the coming years because of declining dependency ratios. The dependency ratio compares the number of dependents, aged zero to 14 and over the age of 64, to the working-age population. In South Asia, the dependency ratio has fallen from 63 percent in 2005 to 55 percent in 2015. It is expected to decline further to 50 percent by 2025. This implies there could be more people earning an income for every child and elderly person needing support. This offers South Asian countries, including Nepal, an opportunity for faster economic growth, because there would be more working people, says the World Bank report. But to reap the benefits of this ‘demographic dividend’, sufficient new jobs need to be created, adds the report. In the short term, growth can boost employment rates as greater labour demand pulls people out of unemployment and inactivity, says the report. Growth can also lead to better jobs, for example when farm employment is replaced by work in factories and offices. In Nepal, one percentage point of economic growth increases the employment rate by roughly 0.045 percentage points, which is pretty low compared to other countries, says the report.